Fear not, for the custodia watch over you! At my FLGS a month or so ago, a local gamer asked if I could paint him a squad of rubric marines; he had some old CSM that he'd never got around to painting, some 3rd party resin chaps along with a metal sorcerer and Lucius the Eternal (who you would've seen finished last post). I picked them up as I went past into town, thinking how fun and exciting it would be to paint blue and gold for once! Ho ho... I'm such an optomist... actually, I was wound up with getting the canoness figure and didn't think much about how HORRIBLE resin-- particularly old, 3rd party stuff-- could be. Sorry for the rotten picture quality-- again. The sorcerer was the only candidate up for the dettol bath, so in he went. And after a while of hesitant pulling on arms and heads, this was about all that actually held: Out came the drill press and the wire cutters... Bit of a side thing here; I'm harvesting boysenberries tomorrow, and I have to practise getting up at FIVE in the morning; a tricky thing for an insomniac. I've been working on these chaps to stop myself falling back to sleep. What you're seeing here is easily 15" of wire and three night's worth of hobby time. What made it more challenging was the fact of the 3rd party bodies not fitting the GW legs, so they needed to be scraped out and greenstuffed. This left them looking a bit tall in the body so I added pouches to try and cover this up. In the words of brother-captain Erecond Gaius, "Brothers, we are being tested..."
Matching arms to bodies again was a bit of a task, and with the way the guns had been attached left for some... awkward... poses. Can't say I tried though. After adding a few strips of parchment and basing them all, I got down to painting, at last. I started with a Very Very Careful spray of corax white-- Throne, they had enough chaos black on them for three times their number, but we'll have to see what happens. Sotek green to Africa; quite an intriguing colour, I might add. So after another hour after the green/blue and an entire Equilibrium album later, this is where I'm up to. I think the guns are going to be red or silver, and there's going to be a lot of yellow and bone to go. Ten past eight, and I'd better go and have breakfast. Bye bye for now. Hallo again! Summer's upon us in full force down the bottom of the world, and last-minute Christmas traffic has been going back and forth past our quiet country road and driving me quite mad! Good thing I've got a few things to work on over the holiday period (when it cools down a bit in the hobby room-- 30 degrees is not good for open paint pots, to say nothing of my mental state) and I'll be expounding on one in particular to-day; you've already guessed by the title, haven't you? Pretty pleased with how this fellow's turning out! The axe still needs some work, but I'm having to be careful it doesn't become the focal point of the miniature... Oh well! When have I ever been careful? They aren't the easiest of things to work with. They'll be getting a post of their own soon. But here! This isn't what I was supposed to be posting about to-day! I wanted to turn her into something special. 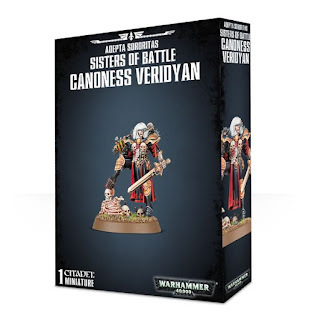 The artwork canoness Veridyan is taken from was the turning point of my developing style from lukewarm to grimdark-- it's special to me, and anyway, I like fringes, exspecially gaunt girls with fringes... this isn't a sexual thing. Then I had an idea. I have a faerie character/mascot/symbol I initially designed for the Sagolanda page banner. She sort of sneaked into everything else as time went on and now she's on the banner of my commissions site! Poor thing doesn't even have a name yet. 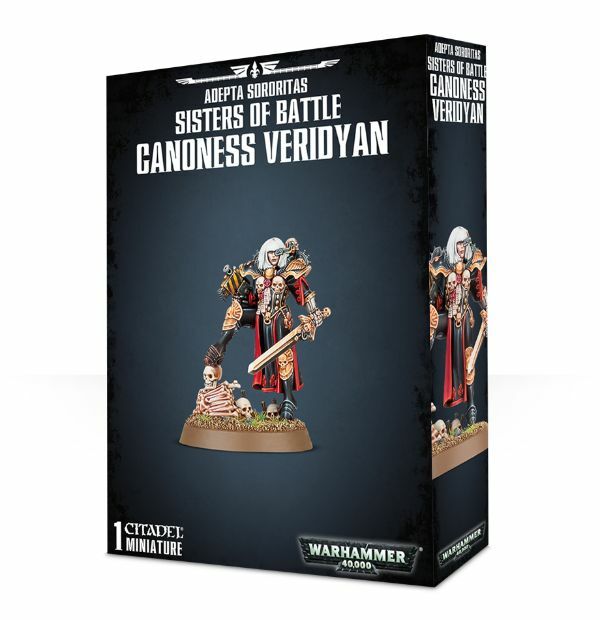 She's an embodiment of how I treat the wargaming hobby (and life in general); take what naturally occurs and twist it way out of line with tortured darkness and an off-kilter sense of piety. So to save you the grief of watching me cut up a valuable figure, here's the canoness after bionics surgery. I swapped out the cloth at the back for a piece of tin to give it a bit of lightness. 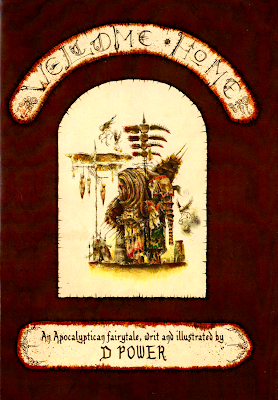 Small problem was that the faerie's left wing is made of razor blades, enforcing the symbol of unnatural altering. I wasn't sure how to represent razor blades... I thought of using real ones, but they're expensive. How about used scalpel blades then? It represents a similar mindset, and it's just as emo, isn't it? So they went together nicely. So here we are as of now. I had to pop an extra skull under her boot to make up for space. Not sure what I did wrong but it's worked out okay. A few more pipes and drug injectors across the wings-- and the base wants tidying up-- then on to painting! If I forget to post the finished project here, she'll more than likely end up on Flikr, just a heads up. So that's that! Next time I might expound a bit on that Thousand sons squad... hee hee, if it doesn't drive me mad. Wish me luck. Oh yeah, Merry Christmas for tomorrow I suppose. Today's post will be a bit of a self-glorifying mess, I'm sorry. We go back and pick out some of the more notable posts on the blog to have another look at. Two years, 100 posts and 20,000 views and a kitbashing business... It's strange really, thinking back to when I started out I didn't even know what to expect of the blogging world. I never intended to make it a regular thing, you know-- I didn't even think I'd carry on for so long! I posted a bit about the Legend of Zelda too, a favorite video game franchise of mine; two pencil drawings of a favorite character and an outlandish figma repaint that scared me at the time, being two notable ones. So nothing really happened until another blogger by the name of Steve Ver chanced upon a a vanguard veteran squad and the first major kitbashed squad I had ever done for the Sagodjur Fjorlag. Steve asked if I wanted to share this on the 40K G+ community and, after getting confused about sharing etc it was there and-- Throne, what a reception I got! 100+ views might not seem like much now, but for someone who thought twelve was a big number--! Here's a funny thing: I made a weapon out of an old sawblade-- more importantly you get to see what I looked like back in January last year, hairy little bugger that I was. All of nineteen years but I looked awfully aged, and I had a MOUSTACHE for Throne's sake, I almost forgot that! After I'd been painting for two years, I thought I was authority enough to write about painting and the mindset involved. This was during the time of my life when all I wanted to be-- as far as 40Kwas concerned-- was the next John Blanche, and I had devoted my hobby time to replicating his blessed style, suppressing my own creativity at my own degradation. I've matured a little (at least I hope I have!) and have since revisited that concept over at Broken Paintbrush. OMG OMG OMG just LOOK at my CA-RAYZY conversion skills!!!!!!!!!!!!!!!!!!!!!!!!!!!!!!!!!!!!!!!!!!!!!!!!!!!!!! I continue to lament how I thought my conversions were so off-the-wall, so I said to my past self, though by Febuary 2015 I suppose I was getting somewhere as far as kitbashing is concerned when I made my 2nd attempt at 7th captain Thunraz. I'd just learned to make greenstuff capes, so yeah, world's my oyster, so to speak. What an odd pose... so glad I didn't go with this model in the end for him! It was from that point that the Lonely Kitbasher finally emerged from the safety of his little hobbit-hole and began to build figures that made even him flinch at their absurdness; 1st lord Klatos and my first attempt at 3rd lord Baldr being the most notable at the time. 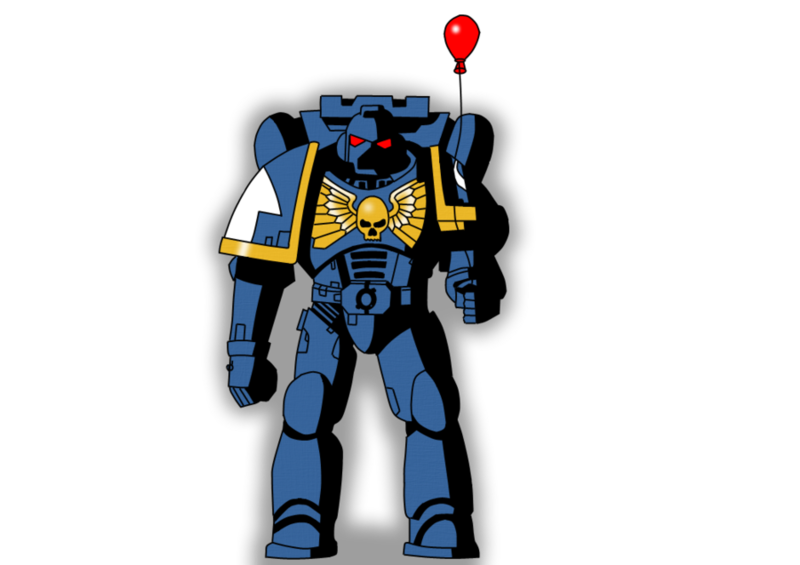 I even made an Anime girl from the grim dark future out of a Sailor Moon bootleg; that's how much my confidence had grown; you know if it wasn't for the kind support of the 40K community I wouldn't have the confidence I do now, so big shout-out to all you lot! When the Imperial Knight was released I knew I had to have at least one in my collection, so as soon as I could afford it I bought one and began on something quite special. And you all know where that led to! Rumour has it that John Blanche himself saw The White Rose and liked it-- I am blessed, truly! The beginning of this year I completed my 2nd attempt at lord Baldr and was Very Happy with him. That led to a few more kitbashes and at this point I could not go back to making Space Marines straight out of the box. I began rebuilding a dreadnought which turned into something I was pleased with too. So that was interesting, I suppose. Have a look back and see what I used to get up to (please, don't-- it's actually really boring) all those many ages ago when dinosaurs walked the earth and fat bloke was editor of WD. I shouldn't make that joke, I'm too young for that to be funny. So what will the future hold? What are my hopes? Going into 2017 is a scary prospect. More painting, that's a thing. Five years of 40K has yielded me barely 2500 points worth of playable army, which is shocking. I sort of hope that word of my kitbashing business will get around, and that people won't be afraid to ask for the most outlandish of commissions! Some day I'd also like to make contact somehow with saint Blanche, will 2017 be that year...? Until then, here's to the new year! Happy Christmas you 'orrible lot, bye bye for now. Hallo everyone, I haven't blogged in a while due to-- as I stated in a G+ post-- a severe case of Everyday Normal life. With the holiday season upon us things have become super-chaotic and I haven't had much hobby time available of late. But now things are settling, I can get my paints out again and cut up more little plastic men!